Last week Dani Moz and T.J. Wilkins were sent home, and this week two more talented artists will be leaving the show. It's actually hard this season, because each one is such an amazing singer. 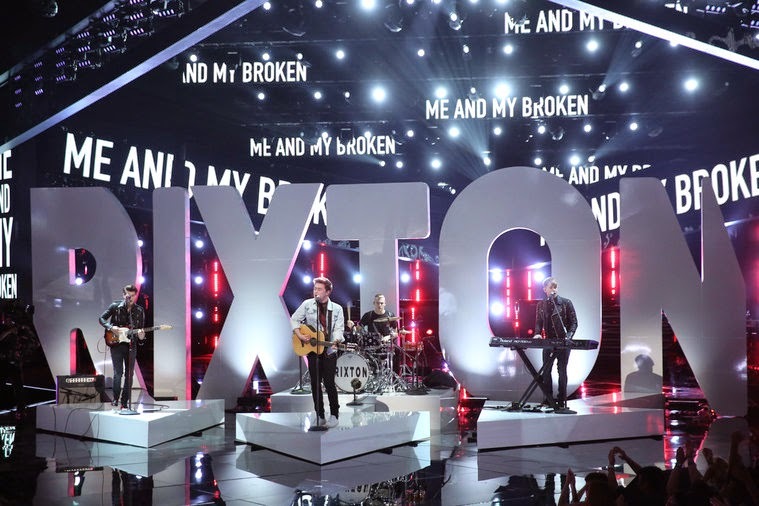 The Top 10 show was opened by the UK band Rixton making their first television appearance in North America. My reflex impression was a British version of a 'boy-bands,' but by the end of the first verse, I really took notice. There was no 'boy-band' feel. There was only a really great band playing a really great song. They introduced themselves on national TV with “Me And My Broken Heart” (available on iTunes) and what a way to say hello. From the vocalist to the drummer... they were amazing. Rixton can now be found in my iTunes library. Tess Boyer was saved last week with the Instant-Save, so she really needed to bring a top-notch performance this week. Singing “Ain't It Fun,” Tess did have a sassy start, but she seemed a little stiff. She loosened up a little as the song progressed, and gave a strong vocal performance. My problem was not with her voice or tone (both were great). I just felt her delivery to be very 'rehearsed.' She did what she needed to do vocally, but she never really utilized the stage in the way she should have. 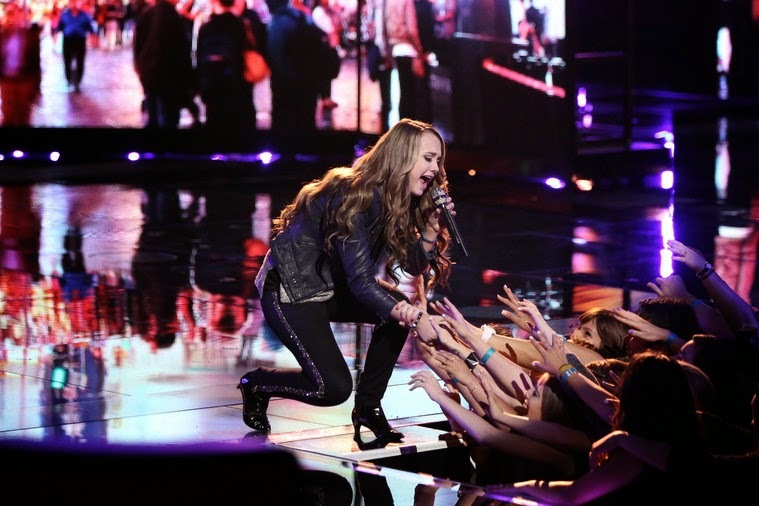 The song had energy, and Tess needed to display that energy across more of the stage. Overall it was vocally well executed... I just didn't feel a connection. Unfortunately, I'm sure Tess is going to find herself in the Bottom 3 again this week. Blake's female country star, Audra McLaughlin, killed it last night with “You Lie.” Performing a song by one of the greatest country stars out there would certainly rattle some nerves, but Audra's performance was absolutely perfect in every way. She started the song bathed in soft lights, which beautifully matched her vocals. She really got to showcase her strengths with this song choice. Her range is incredible, and her tone is pitch-perfect in any register. 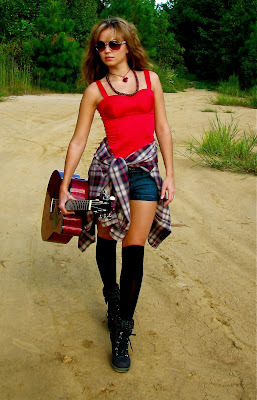 She has the vocal strength and country tone that will carry her very far, but more importantly, she connects with every song she sings. Last night was no different. You were able to see it in her eyes... the emotion, the connection, and the conviction shone through and touched each one of us. I think Usher summed this up best when he commented that only Audra “could move a room... without moving.” I have no doubt she will be among the Top 8. 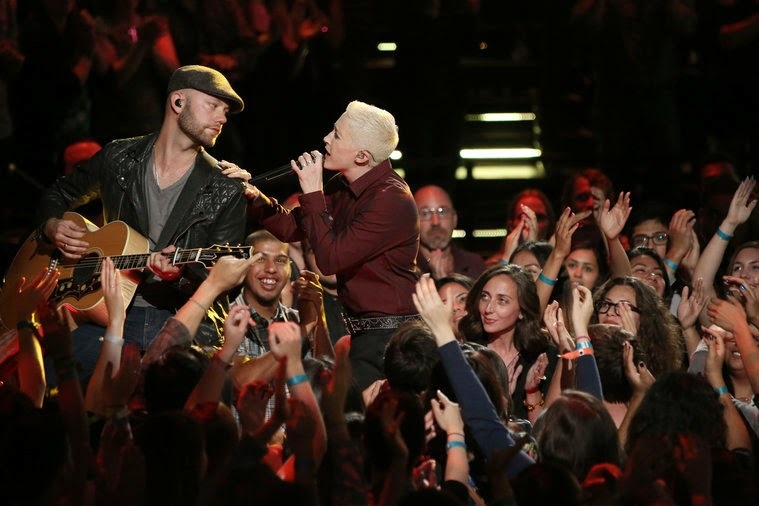 Josh Kaufman performed “This Is It” and won over the audience and the coaches. Josh started soft and low, with an almost seductive tone. The song moved forward, and Josh continued to build higher and louder, and the control he showed from the lower register to the higher is what makes him an incredible singer. His pitch was always perfect regardless of where he was on the scale, and his energy and presence was infectious. His performance got him some well deserved high praise from all the coaches, and we will absolutely see him in next week's Top 8. Singing “Hold On, We're Going Home,” Christina Grimmie showed us again just how much talent can be packed in such a small package. This week, she started soft and slow, while playing the piano and being bathed in a red spotlight. 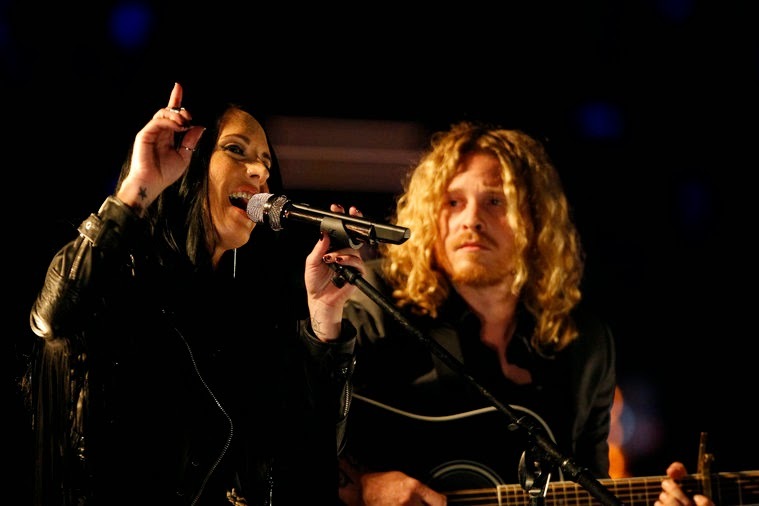 The tone was set, and the feelings of the song and from Christina were flowing outward with astonishing power. The song had some dramatic range shifts that she executed effortlessly and flawlessly. When the chorus came and she got up from the piano, she hit the stage and exploded. She killed her falsetto, and the determination and dedication in her eyes glowed like no other. I am sure she will be one of the Top 8... and probably one of the Top 3. Jake Worthington graced us with the country classic “Run.” During the first few lines, however, he seemed to struggle to maintain control in the lower register. I'm sure performing that caliber of song would cause anyone to be nervous, though. As he moved higher, his vocals were strong and solid. In my opinion, he is much stronger and more confident in the higher register than he is in the lower. For the entire performance, though, he seemed to be really focusing on the technical aspect and not so much on the personal connection that should have been made. He did engage the audience by touching hands as he walked along the stage's edge, but he never made eye contact with anyone. Technically it was just okay, not one of his best, and I think the connection was lost this week. But, his past performances should be enough to move him forward. Everyone is going to have a bad night, and last night, unfortunately, it was Bria Kelly. Singing “I'm With You,” she seemed to struggle some with the arrangement of the song. She started off really well, and her tone did match the song quite well, but it just wasn't the best song choice for who she is. Vocally she was great as always, and her tone and pitch were what we've come to expect from her. The problem was with how (whether her choice or someone else's) the song was arranged. It took away any chance of her being able to form a strong connection, regardless of how well vocally she executed it. The coaches were vague in their reviews, except Adam who did make the “connected” point. This was the first time (ever) that I felt so sympathetic for a contestant. After Adam's comment, you could see Bria starting to tear up. She knew what he said was true, and when I saw the first tear roll down her cheek... Even her own coach was side-stepping around his comments. But, honestly, there isn't a single artist out there that hasn't had something that didn't work as well in reality as it seemed to on paper. So I say to her... "Don't worry." Whether Bria lands in the Bottom 3 or not won't matter. She WILL be around with the Top 8. Fans don't abandon you because of one 'off' performance. With a few jokes about the mic dying, Kristen Merlin took her turn and performed “Let Her Go.” I was worried about her not doing a country song, but those worries were soon put to bed when she started to sing. She performed last night in a higher register than in the past, and she sounded great. She was solid and on key the entire song, but more importantly, she flooded the room with emotion and feeling. From start to finish, she never broke the connection with the audience and just had amazing presence on stage. We will be seeing he in the Top 8. Closing out the show was Sisaundra Lewis with “Oh Sherrie.” She started the first few bars singing a cappella and did really well conveying the 80s rock vibe of the song. I was surprised, actually, how well she delivered this song. It was really nice that she toned herself down and reigned in much of her tremendous power. I actually saw a little bit of the band Heart in her performance. She had nice energy, but stood too far back on the stage with the band. I felt this distanced herself from the audience she was singing to, which lessened the connection she was beginning to build with the song. Her extreme power note at the end of the song was perfect, but was strongly out-of-place with the context and arrangement of the rest of the song. It was a good performance, but I'm not sure if it was connected enough. To predict the Bottom 3, lets first list those that will definitely be part of the Top 8. Kat Perkins is easily safe this week. Audra McLaughlin has captured many hearts and will easily move on. Josh Kaufman has a loyal following and will stay. Christina Grimmie is just an all-around great artist so no doubts there, and Kristin Merlin nailed her performance last night and will move on. So that leaves us with Tess Boyer, Jake Worthington, Bria Kelly, Delvin Choice, and Sisaundra Lewis. From those five, I think Jake will probably be safe, but Tess will definitely be in the Bottom 3. For some reason she just hasn't been able to connect with the viewers. I think Tess will probably be joined by Sisaundra Lewis and Delvin Choice. If that's the case, then Sisaundra and Delvin will be going home, as Tess will be once again saved by Twitter. If by some weird chance (because she has an incredibly strong fan base and has proven her remarkable talent) Bria ends up in the Bottom 3, whomever the two are she's up against will be the two going home, because Twitter will erupt in force to Instant-Save her. Find out who makes the Top 10 tonight at 8/7c on NBC! See you next week when the Top 8 perform on NBC's The Voice! All 10 performances from last night are available on iTunes.